Buy a Chopard watch from Prestige Time and receive discounted prices and the absolute best service. 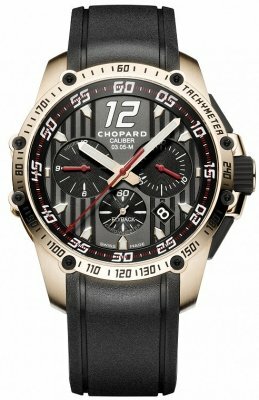 Large selection of Chopard watches in stock. This brand is favored by leaders of industry and celebrities around the world for their masterful craftsmanship and can be seen on many red carpets. Although there are Chopard watches to reflect virtually any personality, any Chopard timepiece exhibits the wearer's excellent taste in fine watches. 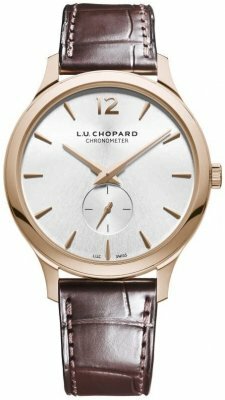 Chopard Watches was founded in 1860 when Louis-Ulysee Chopard (L.U.C.) set out the vision for the manufacture of masterpiece Jewelry and Watches of unique character, blending the talents of both sides of the brand to make a real statement about the mark and its wearer. Chopard Watches are a worldwide favorite of celebrities and are often found on the red carpet of the grandest events. 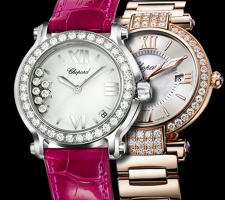 The Watch collections, including Chopard Happy Diamonds, Chopard Happy Sport, Chopard Happy Sport II, Chopard Classique Homme, Chopard Classique Femme, Chopard Imperiale, Chopard Gstaad, Chopard St.Moritz, Chopard L.U.C, and Chopard Casmir are all known from the front pages of the world's glossy magazine covers. The LUC is the ultimate dive/sport watch, with automatic movement and an impressive power reserve. Passion and innovation can be clearly seen in each watch from the L.U.C. collection. Chopard watches pride themselves on attention to every detail and the 3 years of research and development that went into the release of the L.U.C., and the fact that all L.U.C. watches come with COSC certification. The L.U.C calibers are produced in-house at the new Chopard facility in Switzerland. The Mille Miglia watches herald to the partnership of the brand with the icon of vintage automobile racing. The Mille Miglia line prides itself on the similarities between the watches they build and the features of the professional racecar. 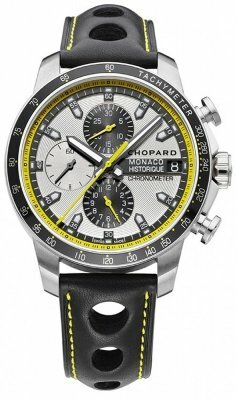 Additions such as a chronograph, split second chronograph, and GMT indications can be used specifically for auto-racing. The dials are also designed to be very clear and legible so they can be easily read during racing conditions. 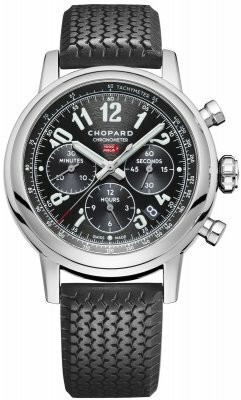 The Chopard Mille Miglia Gran Turismo XL is available in various metals, dials, and colors. Another best-selling Chopard watch is the Chopard Happy Sport . The Happy Sport comes in various shapes to fit every wearer's personal preference; the round and square models provide a more classy look, while the oval boasts a trendy look. For more adventurous wearers, Chopard Happy Sport has the exotically themed line which includes the Chopard Happy Beach, the Chopard Happy Fish, the Chopard Happy Hearts, and the Chopard Happy Snowflakes, featuring corresponding shapes floating in the watch. Two newer introductions to the Chopard ladies line are the Chopard Happy Sport Ceramic and the Mark II Chronograph watches. 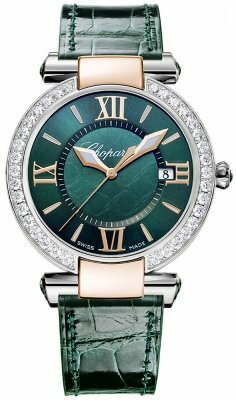 The ladies Chopard Happy Sport Watch can be yours in a round 30mm, 32mm 36mm and 42mm, as well as an XL square with a choice of 18k rose gold with stainless steel or leather bracelet. 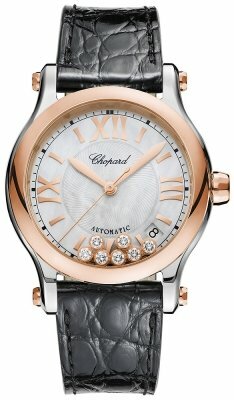 This Chopard ladies watch features some dazzling "Dancing Diamonds" over a mother of pearl dial. There is also a model that has a diamond paved bezel. The Chopard Happy Sport watch is in essence a sporty, yet contemporary design for fun ladies with a strong up-to-the-minute sense of style and great spirit. Chopard watches have always been synonymous with the finesse of high-society and the classic European joie-de-vivre. The Chopard watch is all about living in the moment and doing it in style. The Chopard Grand Prix watches and the classic racing enthusiast's Chopard Classic Racing Mille Miglia watch collection to the 40mm ladies Diamond watches like the Chopard Imperiale Automatic 384239-1003 watch with its diamond clustered bezel and dial powered by the Chopard Caliber 01.03-C automatic movement.